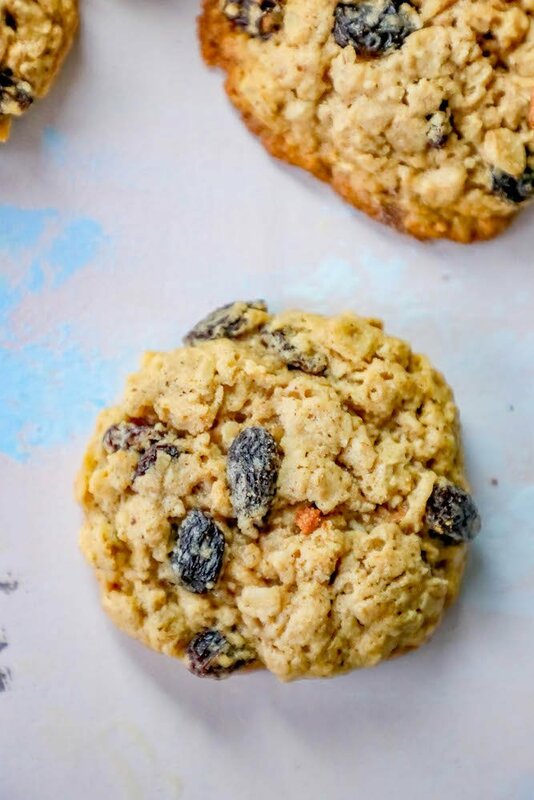 The Best Chewy Oatmeal Raisin Cookies Recipe – delicious chewy oatmeal raisin cookies for a classic delicious cookie everyone loves! Just take me to the best chewy oatmeal raisin cookies recipe already! 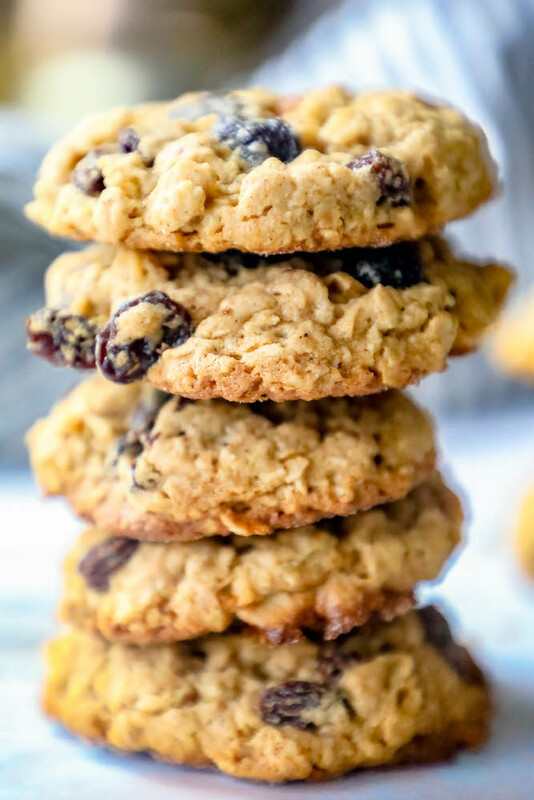 If you want to get straight to these delicious, easy, chewy, and decadent Oatmeal Raisin Cookies – and skip my helpful tips and tricks – please scroll all the way down to the bottom of the page. I get a ton of questions on recipes, so I try to include as much information as possible so they are easy to get right the first time. Sometimes even the best chewy cookie recipe turns out less than perfect – I’m adding my favorite tips for easy, deliciously chewy cookies that are great every time you make them! High moisture content does; so the recipe, baking time, and temperature must be adjusted to retain moisture. Binding the water in butter, eggs, and brown sugar (it contains molasses, which is 10 percent water) with flour slows its evaporation. The dough needs a little extra flour, which makes it stiffer. The stiff dough spreads less, less liquid evaporates, and the cookies are thicker. Mass also helps cookies stay moist–big dollops of dough make softer and chewier cookies than tiny spoonfuls of dough. Bake these thick cookies for a shorter time at a high temperature to firm them quickly and minimize spreading. Most important, don’t bake them too long–remove from the oven when the cookie rim is brown and at least 1/3 of the center top remains pale. The cooked centers will be soft. If you’ve ever wondered can oatmeal raisin cookies be frozen, you’re not alone! 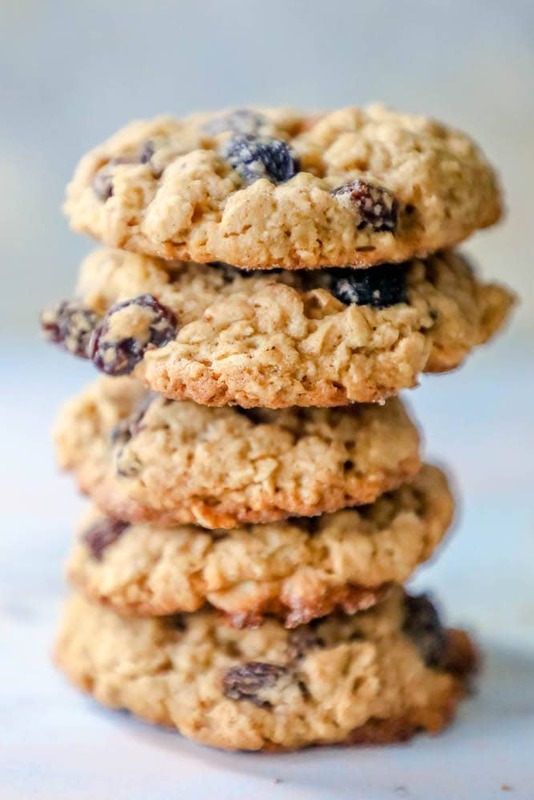 I am often asked what foods can be frozen – and these Chewy Oatmeal Raisin Cookies can be frozen both as dough (separated as formed cookies or as a ball), and after they have been baked. To freeze these oatmeal raisin cookies, you need to first decide if you’re freezing the cookies, or the cookie dough. Next, if you’re freezing the dough, you’ll need to decide if you’re freezing cookies that have been shaped (so you can pull out a couple at a time you need a sweet treat); or if you’re saving an entire batch of cookies to make later. My favorite way to freeze cookie dough is in pre-portioned cookie balls – so I can take out a couple if I want just a few cookies and not a whole batch. Lay cookies on a baking sheet lined with parchment paper. Arrange shaped cookies on parchment paper so they aren’t touching (so they don’t stick together). Freeze until solid – about 5 hours. Remove from baking sheet and place in large ziploc bag, preferably with any extra air squeezed out. For extra frostbite protection, place the ziploc inside a second large ziploc when placing back in freezer. Let cookies defrost to soft when ready to bake – then continue with baking directions in recipe below. Add dough to a large ziploc bag. Squish dough down so it lays flat in the bag – it should look like a thick rectangle instead of a thick blob. Freeze, laying flat, for about 4-5 hours until the shape is firm. At this point you can move it around in your freezer to go wherever if storing this recipe flat isn’t convenient. When going to bake, let dough fully defrost by storing in refrigerator overnight. When baking frozen cookie dough, let it fully defrost, and then continue with baking instructions. 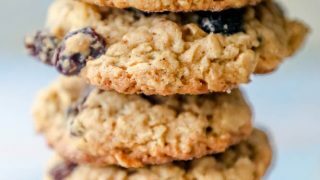 If you’ve baked a huge batch of oatmeal cookies and can’t eat them all, you can totally freeze them for later! After baking, allow cookies to cool completely. Place them in a freezer-safe zip-top storage bag labeled with the name and date. Some cookies can be frozen as-is, while others may need to be individually wrapped or separated with waxed paper or parchment. When you want to eat one, take it out and let it sit at room temperature or warm it in the oven for a few minutes. If you are in a hurry, you can microwave it in 10 second intervals. 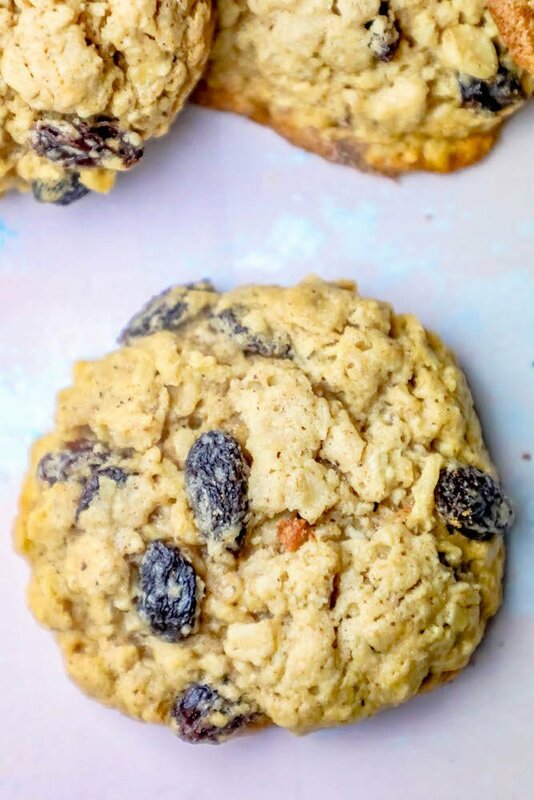 If you love the best easy oatmeal raisin cookies recipe as much as I do, please leave a five star review and help me share on facebook and pinterest! Using a hand mixer or a stand mixer fitted with paddle attachment, cream the softened butter and both sugars together on medium speed until smooth, about 2 minutes. Add eggs and mix on high until combined well. Scrape down the sides and bottom of the bowl as needed. Add the vanilla and molasses and mix on high until combined. Add to the wet ingredients and mix on low until combined. Beat in the oats, raisins, and walnuts (if using) on low speed. Dough will be very sticky and thick. Chill the dough for 30-60 minutes in the refrigerator - if freezing dough, go ahead and use my tips above for perfectly frozen cookie dough. Roll balls of dough (about 2 tablespoons of dough per cookie) and place 2 inches apart on the baking sheets. Bake for 11-13 minutes until slightly browned on the sides. The centers will look very soft and undone. Remove from the oven and let cool on baking sheet for 5 minutes before transferring to a wire rack. Cookies will continue to set on wire rack - for best results, let them cool completely. Now I’m craving cookies! These look so good! I hardly ever get to make oatmeal raisin cookies because I’m the only one in my family that likes raisins. Your recipe looks fantastic. Chewy oatmeal cookies are the best! Chewy oatmeal cookies are my favorite! I could eat a dozen! 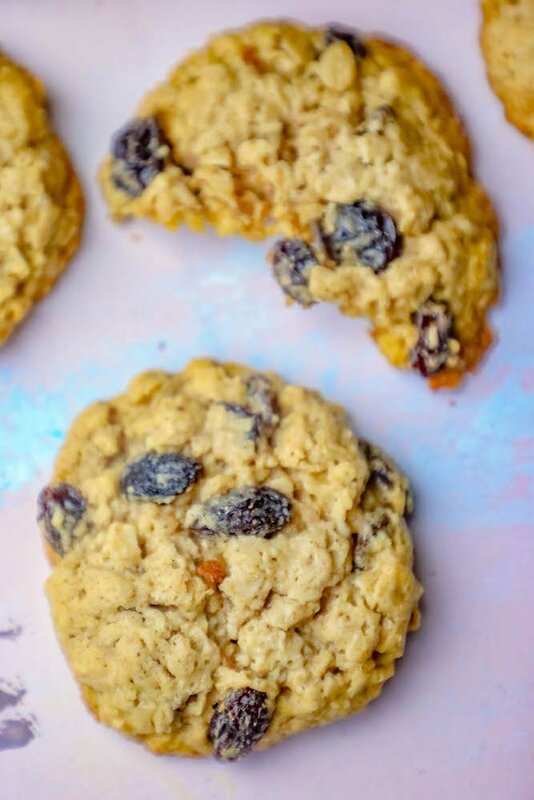 I love oatmeal raisin cookies, especially if they’re soft and chewy! These look so soft, chewy and delicious! Yum! These look fantastic! Thanks for the tips for chewy!